Over the last 35 years as a registered professional forester consultant and professor has provided me with the skills needed to effectively communicate with professionals in the natural resource sector and more importantly with you; the client. My consulting expertise has allowed me to work for municipalities, First Nations, small and large woodlot owners and a range of age groups. Over the years, I have trained individuals from basic ecology to advanced forest measurement techniques, from the basics of compass use to the finer details in using GPS and GIS to resolve natural resource issues. 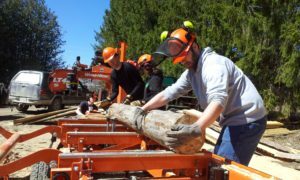 My extensive experience from portable sawmills to field-use computers ensures that you get a practical in-the-field trainer. Let us help you with that next project in a timely way. Contact us for a friendly chat on how our skills can match your immediate needs. … Meanwhile see our BLOG to see a variety of posts on forest and education topics.